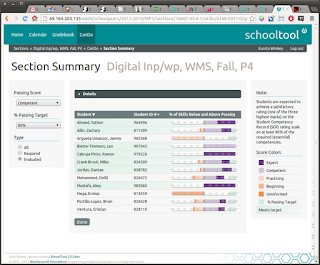 We released SchoolTool 2.3 last week, which wasn't a big update because most of or work this year was focused on re-writing CanDo, our skills, outcomes, standards, competencies, etc. based assessment system. We've actually been working on CanDo with the Arlington Career Center and the Virginia CTE Resource Center since 2005. Virginia CTE has an absurdly complex set of competencies spanning 15 or so career clusters, hundreds of courses, cross-course competencies, and a rolling update cycle and no formal versioning process. 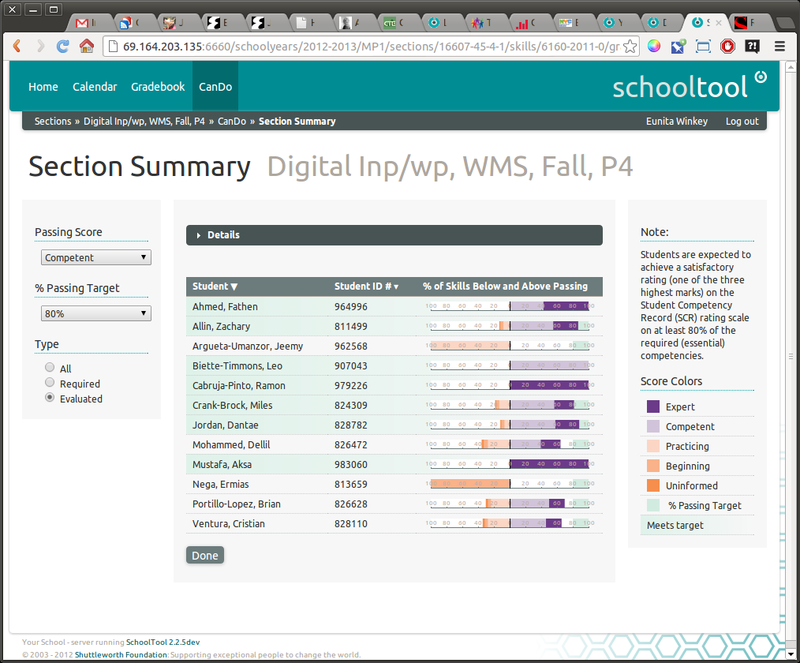 With CanDo you can import the competencies (via a spreadsheet), associate them with courses (including a new feature to automate that process I came up with), score them in section gradebooks, create groupings of competencies for project-based grading, track changes in student acheivement over time and across sections, and generate graphical reports at the student and section level. A lot of what we were doing was taking an open source application that was paid for, designed for and used only in Virginia schools, and, with philanthropic support from Mark Shuttleworth, creating a new version that would work just as well or better in Virginia and as many other scenarios as possible. There's a pretty wide range of cases where you need to track student achievement of a list of outcomes, for example, in addition to 25 Virginia CTE sites, the Virginia Commonwealth University's Autism Center for Excellence is using SchoolTool to track social skills development in individuals with autism spectrum disorders, the Alexandria Seaport Foundation is going to record achievement of math standards via boat building projects in sites across the country, and the Fab Academy is going to monitor student progress in their sites across the globe. For the current SchoolTool community, this is a big new addition to our standard application, yet it is also the most complete and tested. Now that this is out I have to take off my project manager hat and put on my promotional juggernaut hat.